Short conserved domain in transcriptional regulators. Plus3 domains occur in the Saccharomyces cerevisiae Rtf1p protein, which interacts with Spt6p, and in parsley CIP, which interacts with the bZIP protein CPRF1. The yeast Paf1 complex consists of Pfa1, Rtf1, Cdc73, Ctr9, and Leo1. The complex regulates histone H2B ubiquitination, histone H3 methylation, RNA polymerase II carboxy-terminal domain (CTD) Ser2 phosphorylation, and RNA 3' end processing. The conservation of Paf1 complex function in higher eukaryotes has been confirmed in human cells, Drosophila and Arabidopsis. The Plus3 domain spans the most conserved regions of the Rtf1 protein and is surrounded by regions of low complexity and coiled-coil propensity [(PUBMED:11014804)]. 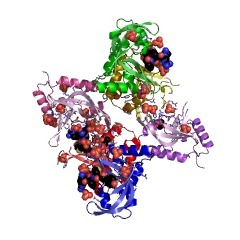 It contains only a limited number of highly conserved amino acids, among which are three positively charged residues that gave the Plus3 domain its name. The capacity to bind single-stranded DNA is at least one function of the Plus3 domain [(PUBMED:18184592)]. 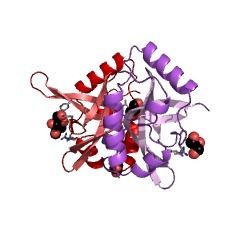 The plus-3 domain is about 90 residues in length and is often found associated with the GYF domain (IPR003169). The Plus3 domain structure consists of six alpha helices intervened by a sequence of six beta strands in a mixed alpha/beta topology. Beta strands 1, 2, 5, and 6 compose a four-stranded antiparallel beta sheet with a beta-hairpin insertion formed by strands 3 and 4. 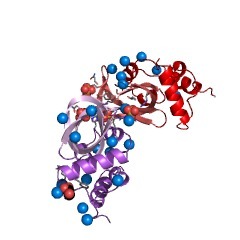 The N-terminal helices alpha1-alpha3 and C-terminal helix alpha6 pack together to form an alpha subdomain, while the beta strands and the small 3(10) helix alpha 4 form a beta subdomain. The two subdomains pack together to form a compact, globular protein [(PUBMED:18184592)]. There are 1155 Plus3 domains in 1149 proteins in SMART's nrdb database. Taxonomic distribution of proteins containing Plus3 domain. This tree includes only several representative species. The complete taxonomic breakdown of all proteins with Plus3 domain is also avaliable. Click on the protein counts, or double click on taxonomic names to display all proteins containing Plus3 domain in the selected taxonomic class. Isolation and characterization of four novel parsley proteins that interact with the transcriptional regulators CPRF1 and CPRF2. The common plant regulatory factors (CPRFs) from parsley are transcription factors with a basic-leucine-zipper motif that bind to cis-regulatory elements frequently found in promoters of light-regulated genes. Proposed to function in concert with members of other transcription factor families, CPRFs regulate the transcriptional activity of many target genes. Here, we report that, in contrast to CPRF2, which operates as a transcriptional activator, CPRF1 functions as repressor in vivo. Two-hybrid screens using CPRF1 and CPRF2 as "baits" resulted in the isolation of four novel parsley proteins which interact with either CPRF1 or CPRF2 in vivo. 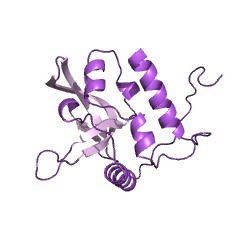 Three of these factors represent new parsley bZIP factors, designated CPRF5-CPRF7, whereas the fourth, named CPRF1-interacting protein (CIP), shows no homology to any other known protein. CPRF5 and CIP specifically interact with CPRF1, whilst CPRF6 and CPRF7 exclusively form heterodimers with CPRF2. CPRF5, CPRF6 and CPRF7 are transcription factors that exhibit sequence-specific DNA-binding as well as transactivation abilities, whereas the function of CIP remains elusive. The newly isolated CPRFs and CIP are constitutively localized in the nucleus in parsley protoplasts. Furthermore, mRNA accumulation studies revealed that the expression of these novel bZIP genes and CIP is not altered by exposure to light. We discuss the possible roles of the newly identified proteins in CPRF1- and CPRF2-dependent target gene expression. Synthetic lethal interactions suggest a role for the Saccharomyces cerevisiae Rtf1 protein in transcription elongation. Strong evidence indicates that transcription elongation by RNA polymerase II (pol II) is a highly regulated process. Here we present genetic results that indicate a role for the Saccharomyces cerevisiae Rtf1 protein in transcription elongation. A screen for synthetic lethal mutations was carried out with an rtf1 deletion mutation to identify factors that interact with Rtf1 or regulate the same process as Rtf1. The screen uncovered mutations in SRB5, CTK1, FCP1, and POB3. These genes encode an Srb/mediator component, a CTD kinase, a CTD phosphatase, and a protein involved in the regulation of transcription by chromatin structure, respectively. All of these gene products have been directly or indirectly implicated in transcription elongation, indicating that Rtf1 may also regulate this process. In support of this view, we show that RTF1 functionally interacts with genes that encode known elongation factors, including SPT4, SPT5, SPT16, and PPR2. We also show that a deletion of RTF1 causes sensitivity to 6-azauracil and mycophenolic acid, phenotypes correlated with a transcription elongation defect. Collectively, our results suggest that Rtf1 may function as a novel transcription elongation factor in yeast. 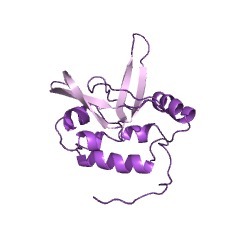 2bze NMR Structure of human RTF1 PLUS3 domain.